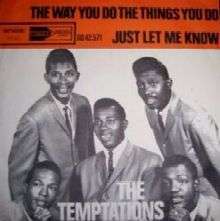 "The Way You Do the Things You Do" is a 1964 hit single by the Temptations for the Gordy (Motown) label. Written by Miracles members Smokey Robinson and Bobby Rogers, the single was the Temptations' first charting single on the Billboard Hot 100, peaking in the Top 20 at number eleven; it also went to number one on the Cash Box R&B chart. Rita Coolidge covered "The Way You Do the Things You Do," and it was released in 1978 as the third single from her most successful album, Love Me Again. In the U.S., the single reached #20 on the Billboard Hot 100 and #18 on the Cash Box Top 100. It also reached #16 in Canada. It is ranked as the 151st biggest Canadian hit of 1978. The song has been an American Top 40 hit in four successive decades, from the 1960s to the 1990s. In 1985, a live version (part of a medley with "My Girl") was released by Hall & Oates featuring David Ruffin and Eddie Kendrick, reaching #25. There have also been versions by Eric Donaldson, Elkie Brooks, the Underdogs, Manfred Mann in 1965 on their Mann Made album, the Iveys (Pete Ham, Tom Evans, Ron Griffiths & Mike Gibbins, before Griffiths quit, to be replaced by Joey Molland, at which point the band changed its name to Badfinger), Little Richard on 1971's The King of Rock and Roll, Jordan Pruitt, and Hilary Duff in the movie Raise Your Voice. ↑ "Item Display - RPM - Library and Archives Canada". Collectionscanada.gc.ca. Retrieved 2016-09-27. ↑ "The Iveys - Way You Do The Things You Do - BBC Radio". YouTube. 2014-04-11. Retrieved 2016-09-27. 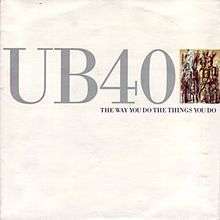 ↑ "Dutchcharts.nl – UB40 – The Way You Do the Things You Do" (in Dutch). Single Top 100. ↑ "Lescharts.com – UB40 – The Way You Do the Things You Do" (in French). Les classement single. ↑ "Musicline.de – UB40 Single-Chartverfolgung" (in German). Media Control Charts. PhonoNet GmbH. ↑ "Billboard Top 100 - 1991". Retrieved 2009-09-15.